If you have ever had a horse suffer with sweet itch you know the misery it causes. Acupressure for sweet itch can be part of a holistic health care program to treat this frustrating condition. Sweet itch is caused by a sensitivity to the bites of tiny, flying gnats. Topical insect repellants, feed supplements like apple cider vinegar and/or garlic and fly sheets are different ways owners try to help their horses, but most fail to give much relief. On the other hand, acupressure can treat the underlying reason for the sensitivity. Gift is a 5 year old, warmblood mare with very itchy skin. She scratches her mane and tail as well as her shoulders during the warm weather and these symptoms fit sweet itch. Gift had been getting topical applications of insect repellant salve to stop the itching, chlorella algae and Citrus C/Q which can help in some cases, but none of this was giving her any relief. I wanted to see if a holistic horse care approach would do any better. The first thing I wanted to do was lower the sugar and starch levels in Gift’s diet. It has been my experience that horses with insulin resistance are more susceptible to sweet itch. This would make sense when you understand the relationship of insulin resistance and the liver. One of the main jobs of the liver is to control blood sugar levels through the storage or release of sugar into the blood. In Traditional Chinese Medicine(TCM) the Liver is responsible for the body responding smoothly to the outside environment. When the liver is not functioning as it should, both blood sugar levels and sensitivity to outside influences are affected. I took Gift off her formulated horse feed and increased her alfalfa cubes. In addition to the horse feed adjustment, my first treatment of Gift focused on clearing toxins from her liver. I gave her a dose of the homeopathic remedy, thuja and left doses of nux vomica and silica. I did a Bowen treatment on her to mobilize her ribs and diaphragm. I wanted the diaphragm and ribs free so the liver would not have any pressure on it from the surrounding organs and connective tissues. One month later Gift was actually worse. The weather had been horribly hot and humid and Gift was really itchy. I worked again on her ribs with the Bowen and gave her one dose on the homeopathic remedy, Sepia. I cut all of her supplements and continued the alfalfa cubes and suggested more fat in the form of chia seeds. I wanted to do some acupressure for liver support and I was amazed to find a very hard knot under the skin in the area of LIV 3 on the left back leg. Liv 3 is a very important point for clearing excess patterns in the Liver. I spent 10 to 15 minutes massaging this knot over LIV 3. Gift seemed to get obvious relief as she relaxed and started yawning. I also worked briefly on LI 11 to help clear Wind. Wind in TCM is often responsible for itching. The next month Gift was better. Her owner said it took 3 weeks but she had less itching even though the hot, humid weather was still present. Flax seeds had been added to the diet rather than chia and the skin was better, but Gift’s hooves were dry and cracked. I suggested chia been added in addition to the flax. I worked again on LIV 3 and the knot over it was much smaller and less dense. I worked again on her ribs and LI 4 on her right front leg. LI 4 is often used along with LIV 3 to clear wind. I am very encouraged that Gift will continue to improve and not only will her itchiness be less but because of the holistic horse care approach she will be a healthier horse overall. 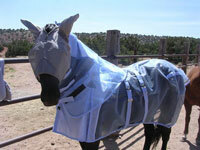 This entry was posted in General Horse Care, Horse Health Care and tagged chlorella, citrus C/Q. chia seeds, holistic horse care, horse feed, sweet itch on August 20, 2013 by Madalyn Ward, DVM.